One or more of the preceding sentences incorporates text from a publication now in the public domain: Pelham, Henry Francis (1911). "Livy" . In Chisholm, Hugh. Encyclopædia Britannica. 16 (11th ed.). Cambridge University Press. pp. 817–823. ^ Cornell, T.J. (1986). Moxon, I.S. ; Smart, J.D. ; Woodman, Anthony John, eds. 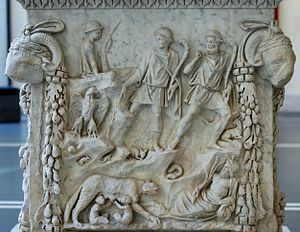 The Formation of the Historical Tradition of Early Rome. Past Perspectives: Studies in Greek and Roman Historical Writing. Cambridge: Cambridge University Press. p. 74. Livius (Livy), Titus. "Book XLVI". In McDevitte, William A. 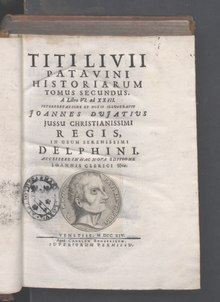 The History of Rome by Titus Livius, with the epitomes and fragments of the lost books, literally translated, with notes and illustrations. London, Medford: George Bell and Sons, Tufts Unuversity: the Perseus Digital Library.